The first published map to show Fra. Kino's explorations. Includes California as an Island! Cette Carte de Californie et du Nouveau Mexique, est tiree de celle qui a ete envoyee par un grand d'Espagne pour etre communiquee a Mrs. De L'Academie Royale des Sciences. 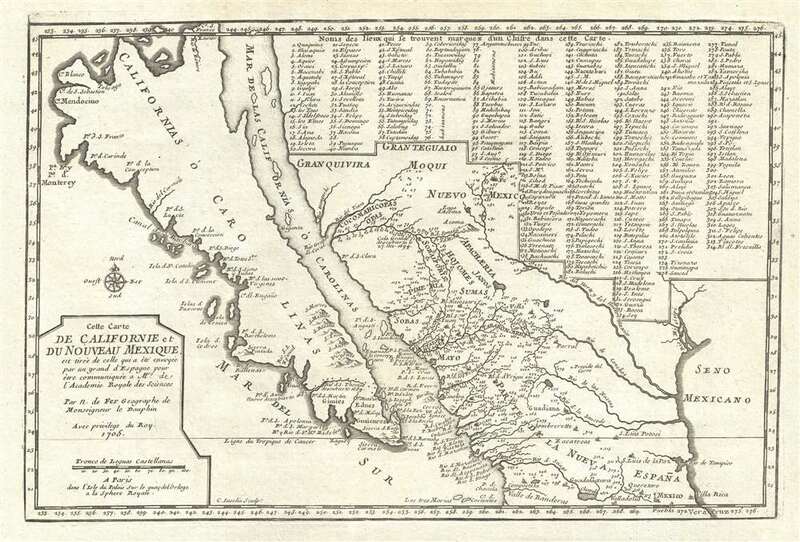 A landmark 1705 map showing California as an island and the first published dissemination of Fr. Eusebio Frabcusci Kino's groundbreaking explorations in New Mexico and California. Drawn by Nicolas de Fer, official Geograph de Monseigneur le Dauphin, this map covers from Cape Mendocino (California) to the Gulf of Mexico and the mouth of the Mississippi River (mis-mapped) and from Santa Fe to Mexico City. Place names are identified both textually and numerically referencing a table of 314 specific locations in the upper right quadrant. As the title suggests, De Fer based this map on documents sent to the Monsieur Regis at the Paris Academie Royale des Sciences by a 'Spanish Grandee.' This was most likely refers to Carlos de Siguenza y Gongora, the Spanish Royal Geographer in Mexico City, who prepared a manuscript version of Kino's map in 1696 (a copy of this manuscript survives in the Jesuit Library of Rome). The original missive was most likely intended for Guillaume Delisle, a highly respected French cartographer who held the title of Geograph de Roi. However, as Geograph de Monseigneur le Dauphin, De Fer would also have had access, a fact on which he was quick to capitalize. It is thus that some cartographic historians have considered this map the 'first pirated copy' of Kino's work. However, close examine reveals that, while Kino's explorations clearly form its essence, De Fer's map stands alone as a separate piece. Kino is best known for definitively proving through exploration the peninsular nature of California. The focus and centerpiece of this map is a striking insular California, a convention that had been popular in the previous century. Unlike his colleague, Delisle, De Fer was not a revolutionary or scientific cartographer, instead his talents lay in synthesizing earlier work and political pandering - both of which are evident here. Provided with unprecedented new information from Kino's expeditions De Fer could only superimpose it on an earlier model rather than, as Delisle or Kino himself did, realize the implications of what he was given. Know, that on the right hand of the Indies there is an island called California very close to the side of the Terrestrial Paradise; and it is peopled by black women, without any man among them, for they live in the manner of Amazons. Baja California was subsequently discovered in 1533 by Fortun Ximenez, who had been sent to the area by Hernan Cortez. When Cortez himself traveled to Baja, he must have had Montalvo's novel in mind, for he immediately claimed the 'Island of California' for the Spanish King. By the late 16th and early 17th century ample evidence had been amassed, through explorations of the region by Francisco de Ulloa, Hernando de Alarcon and others, that California was in fact a peninsula. However, by this time other factors were in play. Francis Drake had sailed north and claimed 'New Albion' (identified here on the northwest coast of California Island) near modern day Washington or Vancouver for England. The Spanish thus needed to promote Cortez's claim on the 'Island of California' to preempt English claims on the western coast of North America. The significant influence of the Spanish crown on European cartographers, especially the important French house of Sanson, caused a major resurgence of the Insular California theory. De Fer's insular California follows the established model as first laid down by Luke Fox in 1635. The only major changes being the addition of Cabo S. Franco Zavier at the northern tip of the island and, in modern day Baja, the River St. Thomas discovered during the Kino-Atondo Peninsular Expedition of 1684. On the opposite side of the 'Mar de las Californias o Carolinas' (Gulf of California) the geography improves dramatically and is in fact quite accurate. The map numerically identifies some 314 specific locations, among them the ruins of Casa Grande discovered by Kino in 1694 (appearing for the first time here), Tuscon (no. 99 or Tuc), and Pheonix (no. 80 or habitations). Even so, typical of De Fer's work, there are a few transcription errors including the sites of San Xavier, San Augustin, and San Martin. The Mississippi River appears to enter the Gulf of Mexico at the eastern extreme of this map but well west of its actual mouth. Although by 1700 La Salle had successfully located the mouth of the Mississippi, by situating the river more traditionally far to the West, De Fer is both dramatically expanding French Louisiana and showing the proximity of French territory to the rich silver mines of central Mexico - a fact that would not have been lost on either the French King or De Fer's personal patron the Dauphin. Pre-Kino cartography that De Fer draws from earlier maps is identified textually. These include major cities in Mexico, Santa Fe, Mexico City, Compostella, Culiacan, St. Luis Potosi, Sombrette, and Sinaloa, among others. Situated to the north and west of Santa Fe are Gran Teguaio and Gran Quivira, speculative Kingdoms of Gold derived from Spanish legends. Teguayo was believed to be one of the seven Kingdoms of Gold presumably to be discovered in the unexplored American west. The name Teguayo first appears in the Benevides Memorial, where it is described as a kingdom of great wealth to rival Quivara, another mythical kingdom to be discussed in the next paragraph. The idea was later popularized in Europe by the nefarious Spaniard and deposed governor of New Mexico. Calling himself the Count of Penalosa, the governor imagining himself a later day Pizzaro and actively promoted the Teguayo legend to the royalty of Europe - even drawing a map that situated it just beyond a mountain range north of Santa Fe. De Fer has repositioned it slightly to the northwest. Quivira, another Kingdom of Gold has its origins in the explorations of Hernando Coronodo, who after his disappointing discovery of the Zuni pueblo at Cibola turned northeast following American Indian legends in search of the supposedly wealthy city of Quivira. Quivira was most likely a wealthy city state located somewhere in modern day Kansas, but 17th century cartographers eventually relocated it westward to abut on the Sea of California. De Fer follows this tradition. Like Kino's own map, which was published on year later in 1701, De Fer's map was engraved by Charles Inselin, a prominent French engraver active in Paris during the late 17th and early 18th centuries. De Fer originally issued this map in 1700 for his L'Atlas Curieux ou le Monde. It was also published in De Fer's 1701 Cartes et Descriptions Generales et Particulieres … d'Espagne. This map exists in two states, this being the second. The only notable difference between the two is the date change, 1700 to 1705, in the title cartouche. Charles Inselin (fl. c. 1700 - 1730) was a prominent French engraver active in Paris during the late 17th and early 18th centuries. Inselin engraved for prominent cartographers ranging from Nicholas Sanson to Eusebio Kino and Nicholas De Fer. He was also a minor publisher of maps and engravings on his own account. Little else is known of his life. Fer, Nicolas de, L'atlas curieux; ou, Le monde represente dans des cartes generales et particulieres du ciel et de la terre…, (Paris) 1705. Very good. Wide clean margins. Blank on verso. Original platemark visible. Mclaughlin, G., The Mapping of California as an Island: An Illustrated Checklist, 134. Wheat, Carl Irving, Mapping of the Transmississippi West, 1540-1861, 78. Wagner, H. R., The Cartography of the Northwest Coast of America To the Year 1800, 462. Leighly, California as an Island, no. 110 Tooley, R. V., Map Collector's Circle, No. 81: 'California as an Island', no. 62. Burden, P., The Mapping of North America II, #760.